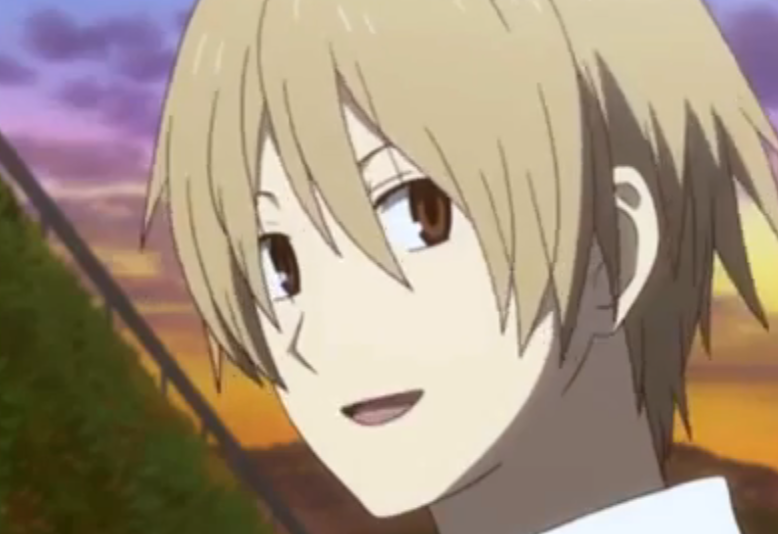 What are you running from, Natsume-kun? Yep… My blog activity has gone down the past few days. I know it doesn’t seem like very much, but I haven’t been approving comments or looking through other people’s blogs lately. It’s probably because I have actually, officially, starting watching way to much anime than is humanely good for my health. It started with Natsume Yujincho (alternately spelled ‘Yuujinchou’). Okay… I must admit, Natsume Yujincho isn’t especially great. I really like the emotions of it, but it’s quite repetitive in the recaps, (I preferred how it was in the manga), and my attention seems to wander over the course of the twenty-five minute episodes. I watched it. And watched it. For almost two days straight, with sleeping breaks. And food breaks. And kicking a soccer ball up and down the street breaks. But otherwise, it was back to Netflix and back to melting my brain through amazing animation and beautifully horrible, extremely gory action scenes. After a quick (and strange) Google search, I found a list of ‘the best’ shonen anime. On the list were Death Note and Tetsuwan Atom (known as Astro Boy to most English-speakers). So I found the second episode of Death Note on YouTube. It was absolutely amazing. And I call stuff like Meipuru Taun Monogatari and Kappa no Kaikata uplifting. I searched up the best shojo anime, because I felt like I needed some variety after watching shonen for two days straight. Most of it was crap, but I saw that Lucky Star was on the list. I watched some Lucky Star. My first impression was that this was, pretty much, an insane anime from the point of the usual little to medium-sized schoolgirl, judging by the loud and brightly colored theme. It did not disappoint in that aspect, but most of the voices were far too high-pitched for my comfort, and the writing was vague and kinda… lame. It didn’t grab my attention like action-adventure shonen animes do. And then I thought about the stuff sitting in my inbox, the people I knew online who I generally talk to nearly everyday, (namely on Pottermore), and the fact that I actually have a life and don’t need to become a completely shut-off otaku. Actually, no, I didn’t think that. I just wrote that to sound slightly less insane then I actually am. Yep. I’m gong to go mess around outside, maybe eat a whole lot, and then see if my Astro Boy has loaded. If not, it’s back to Death Note and Attack on Titan! Or maybe I can find that Rin•ne manga under the huge pile of vintage Donald Duck comics in my living room! Have you thought about doing a short anime? With either. I’d love to see what you’d do. Maybe I’ll post some of my animation on my YouTube channel.